This ship no longer operates for AmaWaterways. See the company’s new ship, AmaDara. 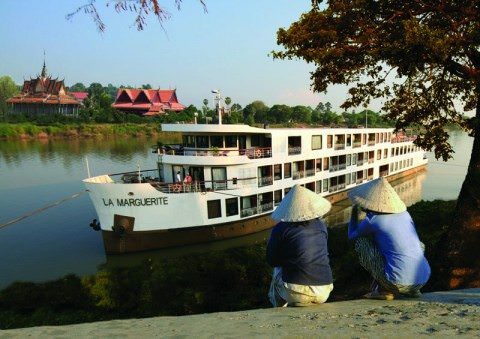 Built in 2009,the stunning La Marguerite is 235 feet long and carries just 92 passengers along Southeast Asia’s beautiful Mekong River. Designed to honour the exotic region in which she sails, her passenger accommodation and public areas are decorated with local artifacts and regional Mekong elements. 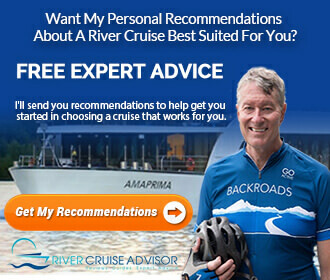 She boasts a style all her own; one that displays all the charm of the old world coupled with the modern amenities and gracious service today’s river cruisers have come to expect of AmaWaterways. All staterooms aboard La Marguerite are outside and ninety percent of these feature private balconies. All staterooms have a sitting area, writing desk, shower with bathrobe and slippers, a hairdryer, mini-bar, and an in-stateroom television. 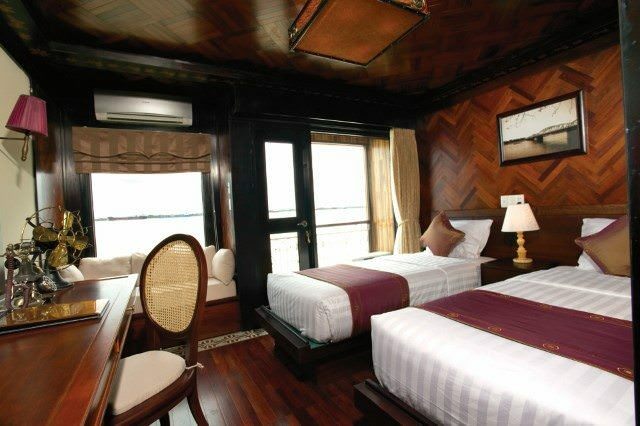 Category C staterooms are located on Mekong Deck and measure 226 square feet. They feature a porthole window and include all the amenities listed above. Category A & B staterooms are located on Saigon and Tonle decks. Like Category C staterooms, they are also 226 square feet but feature a balcony and large fixed window – perfect for viewing the magnificent Mekong. They include all of the amenities listed above. Located on Sadec Deck are the six Junior Suites. At 290 square feet, these rooms have a balcony and large fixed window in addition to a king-sized bed and a bathroom featuring a separate tub and shower. Two Suites located all the way forward on Sadec Deck provide 452 square feet of living space that features a king-sized bed, a bathroom complete with whirlpool tub and separate shower, and a private balcony with two lounge chairs and a table. As with many ships, these suites can sell out quickly, so it can pay to book well in advance. 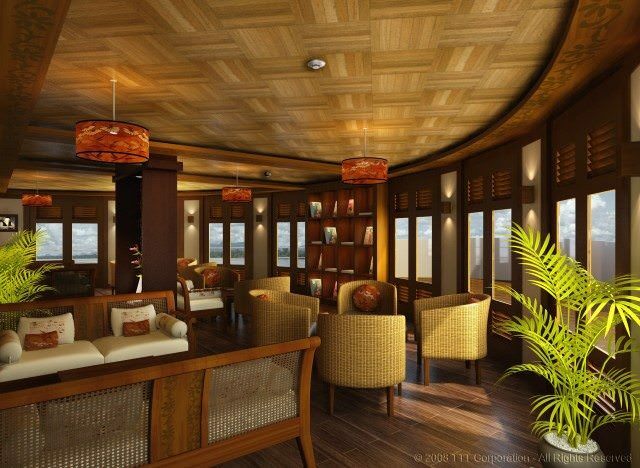 To ensure your cruise along the Mekong is as relaxing as it is enjoyable, La Marguerite features a host of public rooms in which to pass the time. A full fitness centre compliments the sun deck and swimming pool high atop Sadec Deck, and a comfortable lounge and bar area are located just one deck below. A forward facing lounge and library can also be found on this deck. Finally, a reception area and gift shop give way to the beautifully decorated Mekong Restaurant. There is no passenger elevator aboard La Marguerite, which has four public decks. American and Canadian citizens will require Visas for Cambodia and Vietnam for the itineraries operated by La Marguerite. AmaWaterways recommends brushing teeth and drinking only from bottled water, which is supplied complimentary by AmaWaterways. Water is purified onboard and is suitable for bathing, but may not be what North Americans are used to. Have you been on La Marguerite? If so please leave your comments below. Looking to cruise on La Marguerite? Let us know what you want to know in the comment field below, and we’ll get back to you with information. River Cruise Advisor Posts, Photographs and Videos Featuring La Marguerite. name “Halong ” translates as ‘where the dragon descends into the sea’. experience the stupendous beauty of Halong Bay! Vietnam, Cambodia, Laos and Cross-Indochina. Wow, the insides is looking really excellent. On my bucket list for sure! In Sai Gon, There are a lot of hotels, But You should stay Sofitel Plaza Sai Gon. We offer you $160 Net. Yes, dayle, prepare to enjoy. Not to worry. AMA takes good care of you. Bon voyage! We are booked on the Margaurite for this December 19 with our two daughters (ages 21 and 15). Any advice/recommendations for the trip? We still have cabin available on Feb and March. Pls contact us soon. Michael, See It includes the itinerary and dates and prices. And yes, February or March is possible. Where does the Marguerite start and stop and what places does it pass through? Is it possible to take a cruise February or March 2011? if so, with whom? Yes, La Marguerite goes into Cambodia. That looks a fabulous ship to cruise the Mekong. Do you have anything similar that goes down the Tonle Sap in Cambodia? 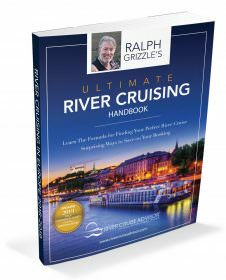 Hi Ralph: Liked your article, pictures, etc. on the La Marguerite. I have a group of 26 that will be sailing on the La Maguerite next November. I know they have been working on improving the on board experience (taked to Kristen) but just wanted to see if you had any additional tips or info? I like the AMA product in Europe. Had a group of 42 on the AMALYRA last October.